We're all finally feeling better and I'm starting to get my energy back to do some baking. I've had this particular cake on my agenda for a while. I've made chocolate zucchini bread, which is essentially cake, and golden beet cake. I knew I had a recipe for chocolate cake with red beets and I've been saving some beets from the farm share just for it. So a few days ago, I made it. 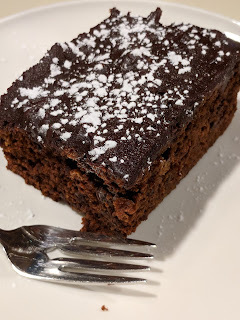 The recipe is for "Secret Chocolate Cake" from Simply in Season. The youngerchild was immediately suspicious. "You never JUST make cake. What vegetable is in this one?" Even after knowing there were beets in it, after a big sigh, the youngerchild ate two pieces. But the next day, a chocolate glaze was requested for the rest of the cake. I made a quick glaze with butter, chocolate, powdered sugar and boiling water. The youngerchild was happier. Another observation is that the beet flavor becomes less obvious the older the cake is. So on the third day, it was definitely more chocolate than beet. I will point out that there is a list of cakes the youngerchild wants me to make: the chocolate mousse raspberry cake from my culinary classes, a Brasilian carrot cake like I did for that fundraiser. There's also baked apples, similar to what we had at a B&B in Vermont. I'll have to get baking.